Thanksgiving is nearly upon us and with it, a memory of waking to the smell of roasting turkey and the sight of you at the kitchen counter, hands white with flour, rolling out dough for your cinnamon-spiced, two-crust apple pie. 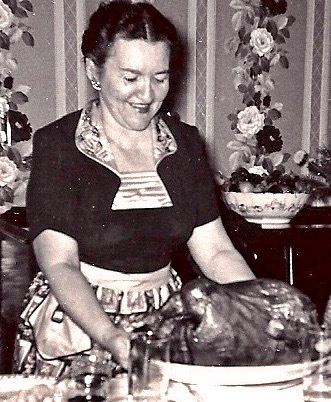 All these years later, I write to tell you how much I appreciate the devotion and thoughtful attention you gave to every detail— the bread stuffing infused with sautéed onions and celery seasoned with sage, the crystalized sweet potatoes with melted marshmallow, the creamy potatoes mashed by hand, the cranberries, cooked down to a sweet confection, the steamed peas infused with fresh mint. It was generous, how you included Dad’s widowed sister, Aunt Betty and cousins Caroline and Sylvia, to celebrate Dad’s November birthday on Thanksgiving. Always, you managed to bake a two-tier, chocolate frosted cake in advance. What a quiet marvel of organization you were. In retrospect, I have come to appreciate the days of planning, shopping and cooking in that 1941 small and square kitchen with a compact refrigerator, single-oven and the one long counter. It helped that our kitchen table sat smack in the middle. You were, of course, my model for Thanksgiving. Even in your eighties and widowed, you managed to continue to gather the family. You were fierce about your independence and cooking was your passion. That last Thanksgiving, in spite of waning energy, you took such pride in your turkey, still moist and delectable, and your single crust apple pie, the filling as always, a tart sweetness. I recall your pleasure, from the few times you joined us in Newton—at how I experimented with new recipes—sweet potatoes, sans marshmallow, just a little nutmeg and maple syrup. I never did perfect a piecrust. With a full time job, I sought out shortcuts; freezer ready crust filled with my own sour cherry filling (Marv’s favorite) did the trick. We have three generations following in your footsteps. When it was time for me to stop hosting, Beth stepped up and I became a helper. My granddaughters, Genna and Shayna, were nine and six the first time they helped prepare your “Grandma Goldie Stuffing.” I toasted bread in the oven. Genna sliced the celery and soldiered through onion tears, to create perfect cuts for sautéing. Shayna zested the orange skin for the fresh cranberry sauce and helped snip the green beans. The three of us mixed the stuffing. This Thanksgiving, the girls now grown, Genna has taken over the stuffing preparation while Shayna will join me the day before to start a new tradition. We plan to bake pumpkin pies, a new recipe, and of course, trim the beans in preparation for my traditional sesame green beans. All these years later, I am grateful for the nourishment to spirit and body you ignited. As always, I will miss your sweet smile of contentment at the table. This entry was posted in Creativity, Happiness, Mindfulness, Relationship(s), Uncategorized, Well-Being, Writing and tagged cooking with grandchildren, gratitude, Thanksgiving tradition on November 20, 2017 by fayewriter.